Riaris Krine’s skin is darkened from countless days on deck under the sun, and her nose has the appearance of having been broken several times over. One of her legs has been replaced with a wooden peg leg below the knee. 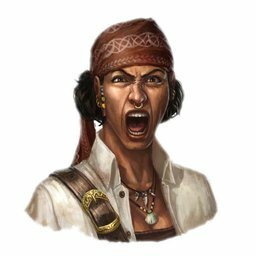 She may be the most vile-tongued wench the PCs have ever met, and her language makes Rosie Cusswell sound like a nun.